Helicopter Links is a worldwide directory of helicopter information. See our Site Map for all categories. Our company name is written as two words: Helicopter Links. (Please remember to add the "s" to "link", hence: Helicoper Links.) Pre-made Helicopter Links logos are available further down this web page. There is no acronym for Helicopter Links except in our logo. We never write "HL", instead we write Helicopter Links. Thanks for your help on this. For print: We'd appreciate if you'd include our web address www.helicopterlinks.com in the body of the article or at the end of articles—in all lowercase letters and without any underline. Thanks. If there is not enough room for our web address, then we'd like to ask for print only, to consider using the first occurrence of our name as HelicopterLinks.com, to help people recognize it's an online-only business, then the remainder times it can be written as Helicopter Links. Our business name is Helicopter Links. Using corporate speak: dba Helicopter Links, HelicopterLinks and HelicopterLinks.com. If you prefer to add some company information at the end of an article, here is our current company statement. Based in San Diego, California, USA, Helicopter Links is a comprehensive, easy-to-navigate international directory of helicopter manufactures, operators, suppliers, maintenance facilities, pilot schools, professional associations, publications, trade shows, air shows, museums and more. Helicopter Links has been online for over 12 years, lists over 3,000 links in 71 categories of helicopter information. Helicopter Links does not require a membership or login and is free to use by anyone 24/7 at no charge. We are media partners with over 18 helicopter trade shows, conference and events. Helicopter Links has advertising options for businesses in the helicopter industry. We also offer one free listing to every helicopter related company, supplier, service or organization worldwide. Helicopter Links is a member of American Helicopter Society (AHS) International (The Vertical Flight Technical Society) and Helicopter Association International (HAI). 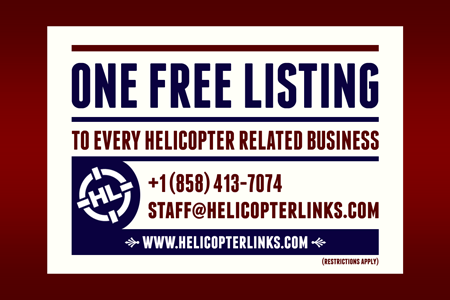 A quick and easy press release concerning Helicopter Links, is our four (4) free listing offers for both profit and nonprofit companies and organizations. We also offer media partnerships to certain helicopter associations, organizations, trade shows and conferences. Restrictions can apply. We feel your readership will benefit from an article detailing our free listing offers. The details of this offer (and additional online graphics for an online article) are found on our Free Listing Offers webpage. When using a Helicopter Links logo in a news aritlce or on your website, we would appreciate it if you link these graphics to our homepage, http://www.helicopterlinks.com/. Thank you in advance!